AC Line Cord, 1.8m, Grounded, Three Wire, as 3112 Plug. Associated Country: Australia, China, New Guinea. For Power Supplies Kt-14000-148R and 50-14000-241r. AC Lind Cord, 1.8 M Grounded, Three Wire, Bs 546 Plug. Associated Country: India. For Power Supplies Kt-14000-148R and 50-14000-241r. Power supply, 5VDC/850ma (For Use in US, Ca, Mx, Br, Jp, Tw). Includes line cord. 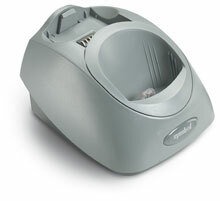 I have the cradle that also has the recharge function for our scanner but the charger accelerates the process and reduces the time it takes to recharge the scanner. I also use for scanners paired to other devices where a cradle is not used. WE use this on our equiment check out lab. We used to have to keep our computer on to keep the wireless scanner charged and running. Now we can turn off the computer at night and keep the scanner charged. This product powers everything as decribed.